We have been to Paris, Prague, Amsterdam BUT, Calgary downtown will be forever SPECIAL. I should admit we equally LOVE Toronto and Vancouver – other Canadian cities and their downtown, but each time we drive to Calgary, we fall in love with it again (and again). Too bad, we have not moved to Calgary (yet! ), but who knows. Our favorite hangout place is the downtown area. 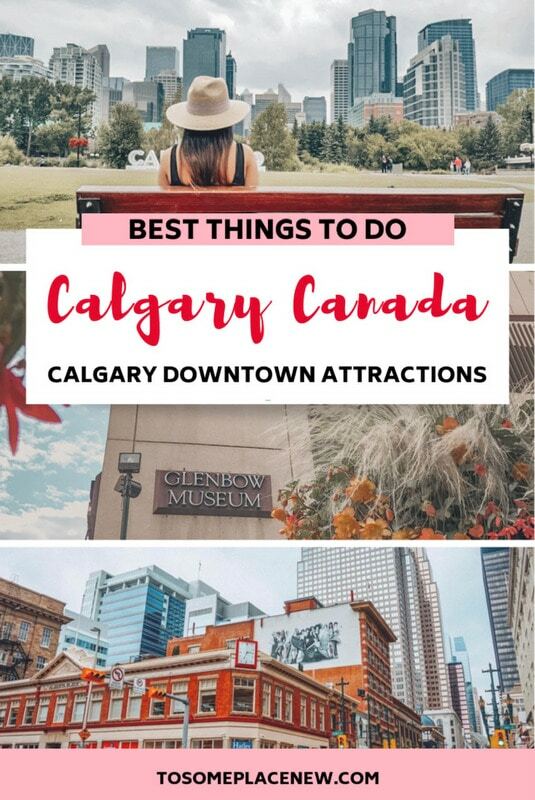 So we got all the best things to do in Downtown Calgary for your itinerary, including Calgary attractions, shopping, hotels and restaurants. Use this guide to get some of the FREE things to do in Calgary. The image of the Calgary Tower, actually warms up my heart. It is my very own Eiffel tower! 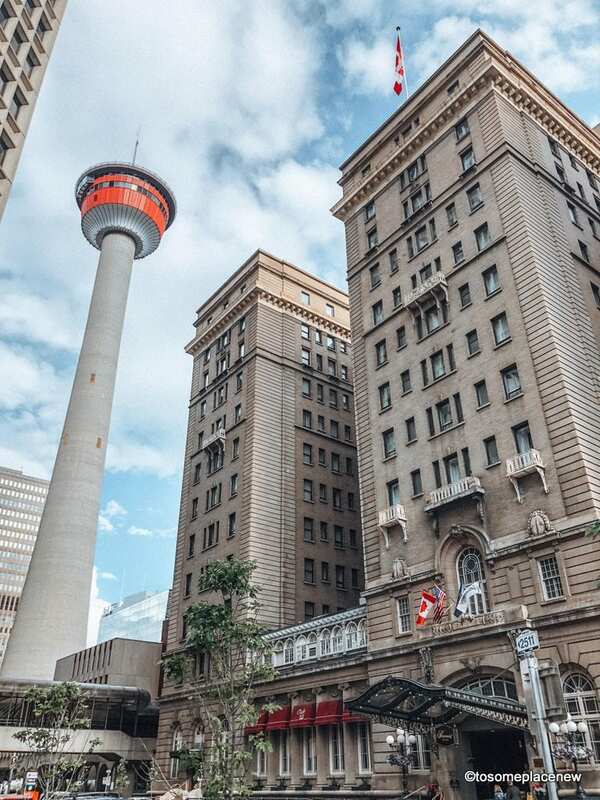 As we arrive in downtown Calgary, the tower with a red ribbon (red tower deck, my imagination is at play here) welcomes you with a BIG smile and it follows you everywhere in downtown – in a parking lot, restaurant, park, hotel – like everywhere. The Calgary Tower is a free standing observation tower located in Downtown Calgary. It has an observation deck which offers 360 degree bird’s eye view of the city, all the way to the Canadian Rockies. It is a real treat to see the city from top – you can view the Calgary Saddle dome, Bow River and downtown buildings. 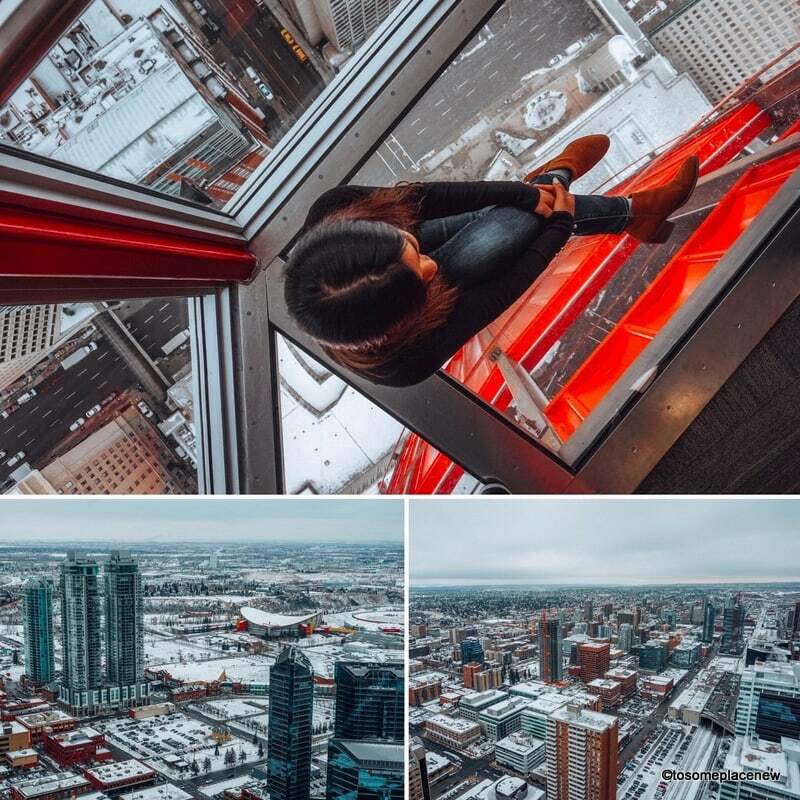 We have visited the Calgary tower and the observation deck at different times of the year. During winters, the city looks like it’s covered in vanilla frosting and during summers, it’s the bright blue hues that delights you. The observation tower has a glass floor and you can walk over it, take photos and if you are like me, you will take 1000000 minutes to muster all the courage to sit this way and not look down! You see, I love sky rise buildings and city views, but for the love of God, I am TOO afraid to look down, sorry! On the second floor of the Calgary tower, you can sit back and relax in their restaurant. 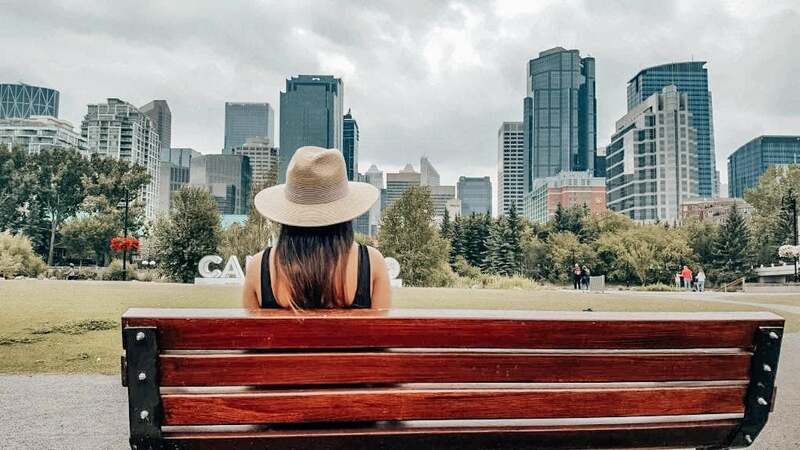 Summer also calls for food and fun times, so you will see plenty of summer activities at the foot of the Calgary tower. 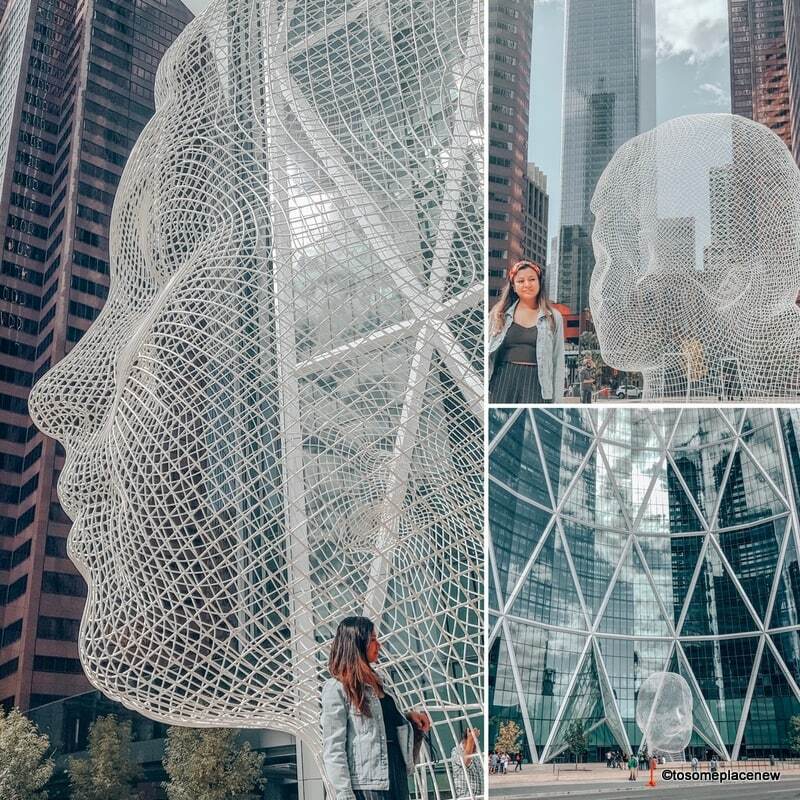 This tower gives you great photo opportunities and is iconic to the city of Calgary – so don’t miss it! Our favorite – favouritest (sorry I ran out of superlatives here) spot in Calgary. 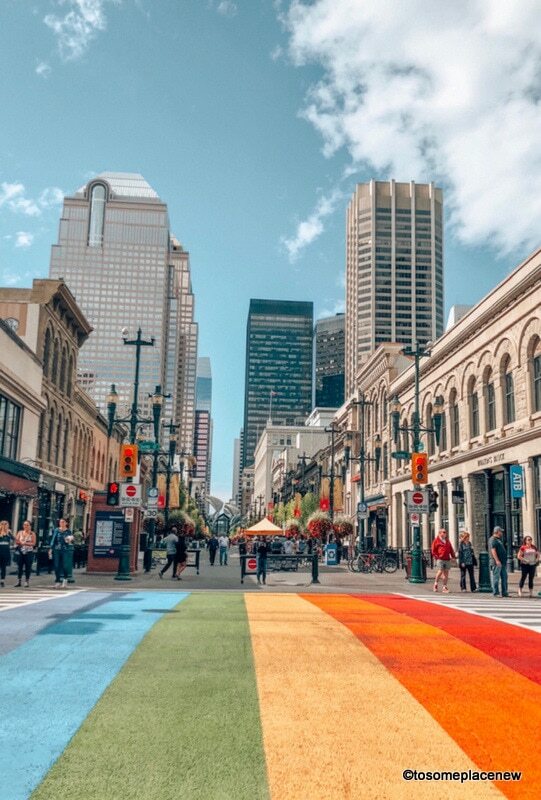 Colorful, vibrant and lively lane – this is the Stephen Avenue Walk. Also my favorite because it is sprinkled with historical facts in every nook and corner of this lane (so watch out for those). This all-pedestrian lane is bustling with activities in the summer time – ice-cream, beaver tails, music, food trucks, local art and displays and more. Stephen Avenue is also lined with some of the BEST restaurants and pubs in the downtown Calgary area. There is a shopping mall of the same name – Stephen Avenue Place located nearby. 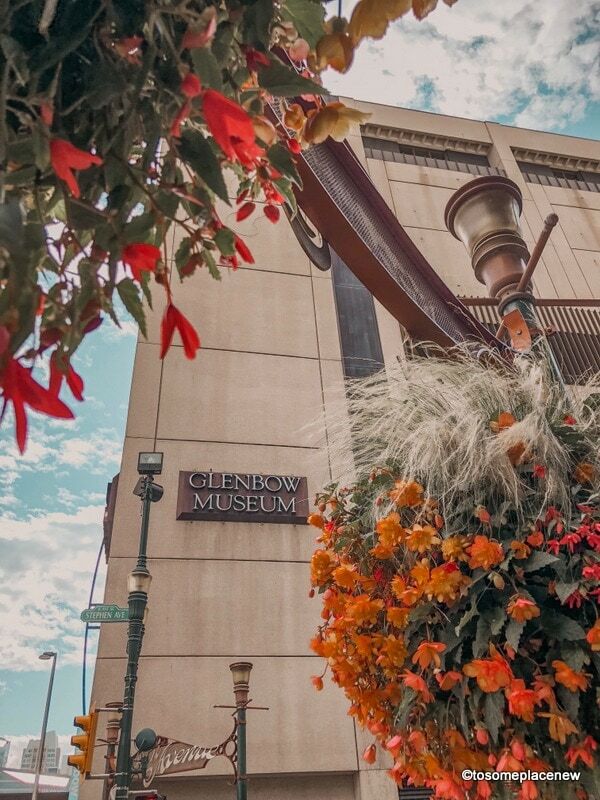 Glenbow Museum is an arts and a history museum located in downtown Calgary. It is one of the largest museums in western Canada and boosts of a variety of arts display and historical artifacts, all year around. The museum also conducts art exhibitions and events from artist around the globe. They are closed on Mondays and are open other days from 09:00 am to 5:00 pm, on Friday they are open till 08:00 pm. The Wonderland Sculpture is a HUGE wired head sculpture of a young girl located in front of the landmark building – The Bow. The sculpture is about 12 metres tall and was created by Spanish sculptor – James Plensa. You can actually walk inside the “neck” of the sculpture head. It is NOT allowed to climb on the sculpture. Definitely an awesome sight in Downtown Calgary – also one of the Instagrammable spots in the city. The Bow is the stunning (office) building, located in downtown Calgary. It is easily the most recognizable skyscraper in the Calgary skyline. The office space are the headquarters of Encana Corporation and Cenovus Energy. The Bow building is ONE of the tallest buildings in Calgary, and it is characterized by a curled or “C” shape. This skyscraper has 58 floors, including an observation deck – on the 54th floor- for visitors, with a beautiful garden. There are retail and dining floors as well. The + 15 skywalk system allows pedestrian to access other buildings in the vicinity. Prince’s Island Park is located on the north end of downtown Calgary and along the Bow River. This is a stunning green space in the middle of the city and a perfect place to relax, take a stroll or hang out with friends and family. For a long time, I was actually confused why this park was called Prince’s Island Park and the Eau Claire Park, which is located very close to this place. So the island park is named after a businessman named Peter Anthony Prince. He founded the Bow river Lumber Company and the Eau Claire Lumber Company. In the late 19th century, Eau Claire mill was established along the Bow River and a channel was dug to transport logs to the mill. Over the years, this channel separated from the main land and now became the Prince’s Island Park. Prince’s Island Park is a beautiful oasis and a great spot to admire the city’s skyline. This park also hosts music festivals (Calgary Heritage Festival, Calgary Folk Island Music Festival) and other events in the city. We were here during the 150th celebrations of Canada Day and just fell in love. The park also has a riverfront café and unique (name) bridges over the Bow River, including a Jaipur bridge. The mill area that was built by the Prince’s Island Park, is now known as the Eau Claire area. As you walk away from the Island Park and towards parking lots, restaurants and the Sheraton hotel – that’s the Eau Claire area. It also has a market space of the same name – Eau Claire market. The Peace Bridge is a foot traffic bridge located over the Bow River in Downtown Calgary. It was built by another Spanish architect, Santiago Calatrava. The bridge is stunning at all times of the year. Our favorite time is during fall, as the red color of the bridge, shines brightly and warmly against the fall foliage. The bridge was built and opened recently in 2012. Calgary Chinatown is located in the northeast part of downtown. The Chinese community arrived here in the 1880 and this neighborhood is a testimony to their contribution and legacy. The Chinese Cultural Centre located here has a lot of traditional art and decor, which makes it one of the unique centres in the whole of North America. 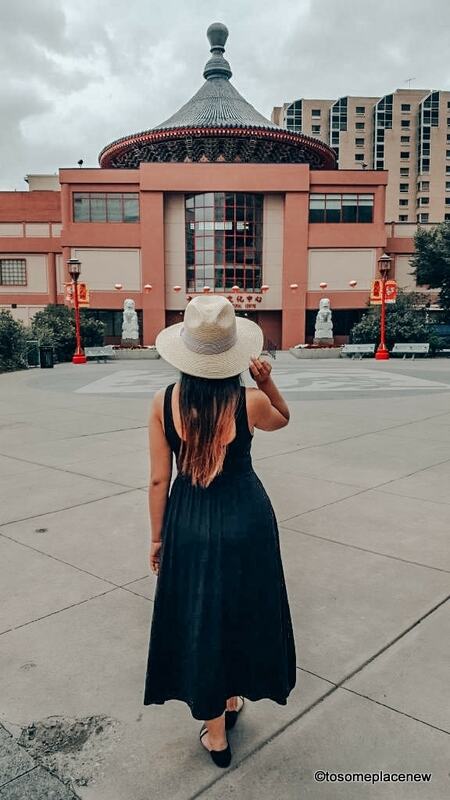 Visit the Chinatown to admire the quaint Chinese neighborhood and for some DELICIOUS food! In Chinatown, there is a New Art Gallery, which is worth visiting. It is a contemporary arts display gallery, operated by a non profit organization since 1975. The Famous Five are the five (5) prominent Canadian pioneers who fought for women suffrage – right to vote, be a part of the senate and participate in public matters (Person’s Case led by Emily Murphy). The Famous 5 statues have citations inscribed on them. The Olympic Plaza is a beautiful park and “hang out” space for locals (especially downtown workers) and tourists alike for a quick rest or a lunch break. The plaza was built in 1988 for medal ceremonies of the Winter Olympics. During summers, it is a great place to enjoy some cool breeze, music and watch kids play. Winter time, bring your skates in to enjoy the ice rink here. “Skate Hut” at the Olympic Plaza is a beautiful outdoor rink, which is perfect way to ring in the holiday season. Calgary’s CORE Shopping centre is a popular shopping arena in Downtown Calgary. It spans over 3 city blocks and boasts of Holt Renfrew’s flagship store along with 160 other retail stores. CORE Shopping centre consist of 4 floors – of retail bliss and cuisines (restaurants and food court), but also a delightful indoor botanical garden, called the Devonian Gardens. We accidentally happened to drop by the CORE shopping centre and explored the beautiful indoor oasis. This place has so much greenery – tons of plant variety (over 550 kinds) and pool with colorful fishes (koi pond). There are designated children pay areas and dining/seating tables as well. 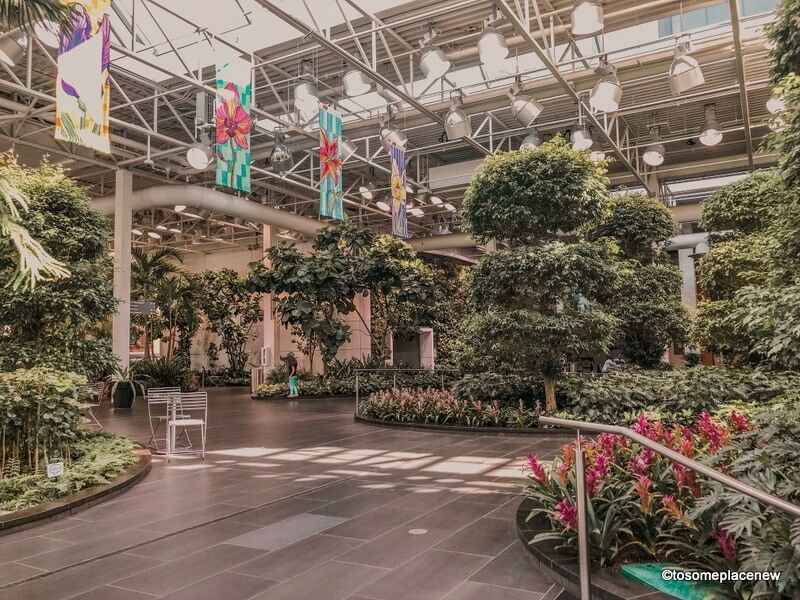 Devonian Gardens also conducts exhibitions and art displays. Their living wall is a beautiful creation – a MUST visit! This will surprise you, pleasantly. Armengol Statues are tall (and naked) statues of men and families in a small park, located on the 1st Street and 6th Avenue SE in downtown Calgary. These statues are about 6.5 meters tall and are 10 in number. The images are known to be depicting the “Brotherhoods of Man and the Family of Man”. Most Fairmont hotels in Canada are sort of a landmark in their city and the Fairmont Palliser hotel in Downtown Calgary is no different. This iconic hotel is a historical landmark – it was built in 1914 when railways were developing and engulfing western Canada. What was then a “mere” resting place for travelers and workers is now a luxurious hotel with stunning interiors and architecture. During winters, there is a giant gingerbread on site (lobby) that visitors come to see and photographed. The Calgary Tower and other tourist sights can be seen from the balconies of the Fairmont. You can photograph the Calgary tower and the hotel next to each other, or take a peek at the Canadian Railway sign close by, which is a reminder of the past days of industrial growth. It’s like living a piece of history. 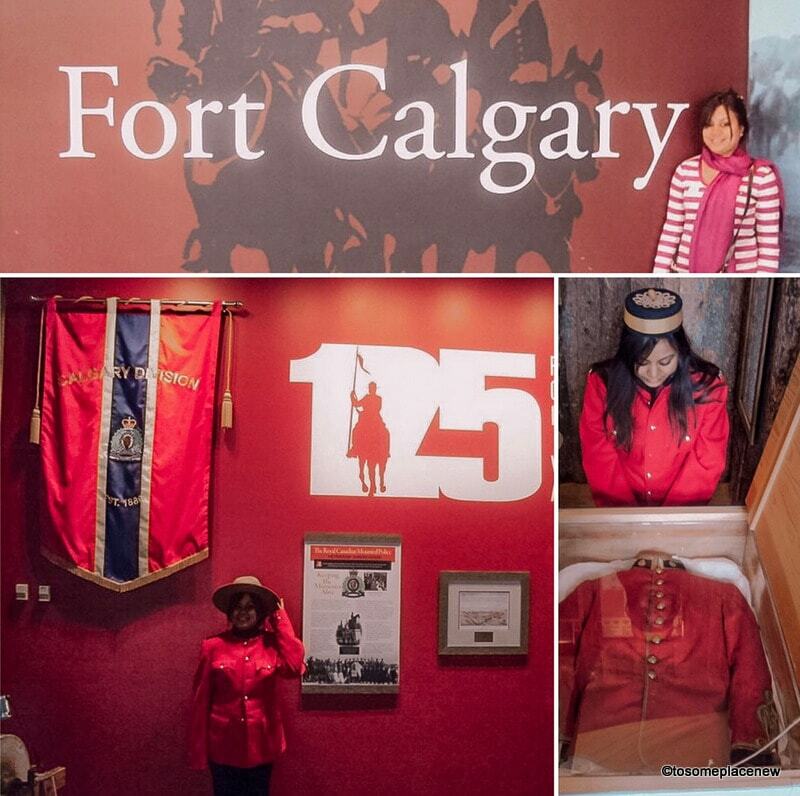 Fort Calgary site was founded by the North West Mounted Police to curb illegal whiskey trade. It was founded in 1875. The fort today, is a national historic site and houses a museum with many remnants of the by-gone days. The fort has some of the structures in its original state and some are re-created. When you explore the museum living quarters and walk from one room to another, it is like living the history itself. And if you are like me, who LIVES, BREATHES and WEARS history, you will find a cheeky girl with red mounted police uniforms! Downtown Calgary has some of the finest and luxurious hotels. The location is on-point, with quick access to city’s TOP highlights, restaurants and pubs, shopping and the river valley. 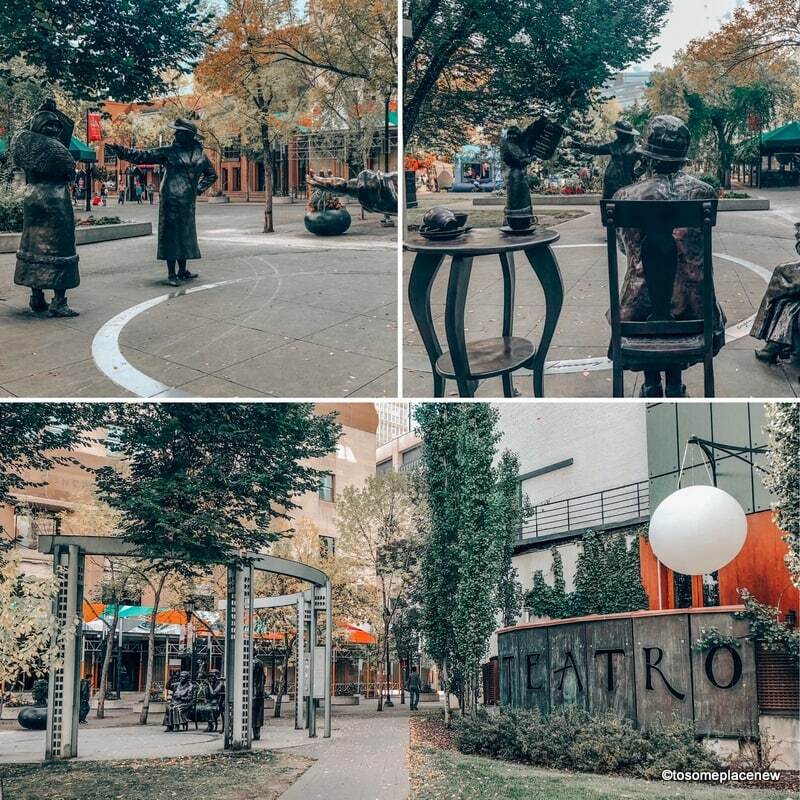 We have an awesome guide to hotels in Calgary up on this blog and we will pick 3 favorites from the downtown area here for you. Fairmont Palliser Hotel – One of the luxurious and iconic hotels in the whole of Calgary and located in the downtown area is the Fairmont Palliser Hotel. The location of the hotel is very convenient to access all the tourist highlights, including restaurants and bars. The hotel also has 2 restaurants and a spa on-site. This hotel is perfect for couples, individuals and small families. FUN FACT: Salil and I were engaged here. ALT Hotel East Village – This is a new hotel located in downtown Calgary (Confluence Way). This is budget to mid range hotel offering modern amenities and location convenience. The exterior design of the hotel is very eye-catching and you will probably notice it when you drive to the downtown area. Calgary has multi-cuisine restaurants and DOWNTOWN Calgary is full of them. Other then food, we feel ambiance is key and these restaurants do live up to the hype (without a hefty price tag). All the listed restaurants are added to Google Maps in this post. Native Tongues Taqueria – Mexicana bliss in your month. Love the décor of the restaurant and the quality of Mexican food here.